Ever wondered why your child gets more upset the nicer you are? Or why your child is always arguing with you, doesn't listen or seems intent on doing the opposite of what you want? Now you no longer have to worry - Communicating with Kids has the answers. This new book explains how so often children are not resisting our messages but the way we are sending them. It demonstrates why some of the ways we communicate lead to exactly the opposite of the behaviour we want, and provides methods to tweak your language and approach so that children are willing to help you. So much of the parenting advice we hear works against a child's developing brain, so this book shows you how to work with it instead - which makes all the difference. Once you understand the difference between what you are saying and what your child actually hears, life with children becomes so much easier. This book is all about communication because apart from that, there's no other advice you need; the best way to bring up your child is to be yourself and do it your way. 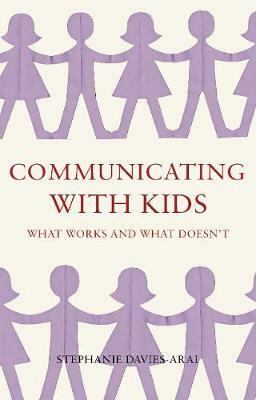 Communicating with Kids is a book guaranteed to help all parents, whether they veer towards the methods of Penelope Leach or Supernanny, or have never read a parenting book before. It is not based on any parenting ideology, but on genuine experience with a wide range of children. It is a plain-talking book that presents communication methods that work, so parents gain the confidence to be themselves.